Nearly two hundred years have passed since the birth of Karl Marx and continuing to this day the influence of his economic views, insights and theories can still be felt. However, since the publication of Das Kapital, the scientific community has not been sitting idle – it is time to evaluate Marx as an economist and explore what he can bring to modern economic thinking, particularly post-Keynesian economics. Starting with Marx’s schemes of reproduction, which, it is shown, are the basis of the linear model of production as used since the 1960s by Piero Sraffa, Michio Morishima and others, the book reviews and assesses Marx’s major economic theses. These include: the labour theory of value; accumulation and technical change and its impact on labour; the concept of unproductive labour; the tendential falling rate of profits; the evolution and determinants of the share of wages in national income; as well as short-run and long-run economic dynamics. The Economic Ideas of Marx's Capital updates the theses of the labour theory of value and the conditions for balanced growth using the recent scholarly literature, and also further develops issues related to Marx’s concept of productive labour. 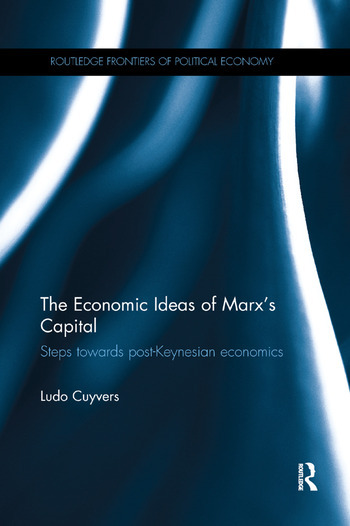 Moreover, the book analyses the intellectual relationship of Marx’s economic theory with post-Keynesian neo-Marxism, particularly in the writings of Michal Kalecki, Joan Robinson and others. By doing so, the book shows the need and possibilities of integrating major insights of Marxist and post-Keynesian theory. This volume will be of interest to those who wish to explore Marx’s economic theories through a non-ideological approach, as well as students of Marxist economics, post-Keynesian economics and the history of economic thought. What can be learned from Piero Sraffa’s "standard system"? What is the labour theory of value saying? Marx’s "average sector" and Sraffa’s "standard system"
What is the logic in transforming values into prices of production? The transformation of labour values into prices of production: logic or reality? A short digression into technological coefficients, subsistence wages and the "law of value"
What about social necessary consumption? Marx on the relationship between capital accumulation, the rate of profits and the wage rate, and the so-called "industrial reserve army"
How did the early post-Keynesians look at mechanisation and technical change? The case of Joan Robinson’s "real-capital ratio"
The money supply in post-Keynesian economic theory. Technological innovations as an "external market"
Long waves in economic activity and accumulation? Which of the fundamental principles of Marx’s economic theory are still intact: value, unproductive labour and the "law of value"? What about the dynamics in Marx’s economic theory: technological innovation, the rate of profits and exploitation in the long run, economic cycles …? Is Marx’s economics an independent doctrine, a module of the post-Keynesian theory or a starting point for a post-Keynesian neo-Marxist synthesis? Ludo Cuyvers is Emeritus Professor at the University of Antwerp, Belgium and Extraordinary Professor at North-West University, South Africa.